What Makes A Great Chess Player? This can’t be an easy road at all. Getting on the top of the chess masters list requires hard work, lots of training and practice. There are a lot of people that think anybody can become a chess player, this is true, but becoming a great one stays for the rare ones. So, what does it really take to achieve a grandmaster title? Here are some basic features every great chess player needs to acquire. Yes, this is an old saying and it is also an important factor in a chess game. For sure, different people will not benefit the same from the same amount of hours spent by the chess board. Some will need less time to achieve the master level and this is where talent comes pretty handy. But practice still stays necessary condition which will help anybody to achieve maybe not first place at the world list of chess masters but it will sure get anybody on a higher level of chess performance. This game really requires extensive passion because it will be much easier to deal with this tough road this game brings. Chess masters talk about this game all the time with huge enthusiasm with no fear of the unknown chess always brings. The whole heart is needed to create a great desire for overcoming the opponent. This will to win no matter what is something not everybody has so not everybody can understand and play this game. Chess masters find chess as a very serious job and don’t let anything distract their attention to achieve their chess goals. Winning is everything here and even there are outnumbering hours of training needed to achieve this they will do it no matter how much it takes. Chess journey requires a mind that will focus on the strength and form of the play rather than the immediate results and a real chess player wil improve his skills every day. Chess strategy requires outnumbering decisions in just one single game. This hasn’t been totally cleared yet but it has been noticed that people who are better at making decisions have a significant advantage in this game. Regarding confidence, it is really amazing to observe a chess game while great masters play and reach the moment when one of them recovers fast after a poor performance. These people could teach others a lot about believing in themselves. This has really become a huge dilemma today because of enormous digital development. Many people still stay by the fact that it is just not the same thing as it played in person. It is the human touch that makes the significant role which makes all more interesting while playing a chess game. Of course, on the other hand, there are many staying by the modern, digital approach of this game. Honestly, there is no universal solution about this and it is very individual what makes a better solution. Seeing only a little chess board on your screen and empty chat box below while enjoying your pajama brings really different experience comparing it to a huge hall full of other players and your opponent right in front of you. It is all about your goal. If you just want to play some quick game of chess during your free time there is nothing wrong about turning on your computer and have some fun. But if you are interested to reach some higher levels of this game you should dedicate more time of playing it in “real” life. Many people believe online playing is more effective and efficient but the fact is there is no best fit for everybody. Although the influence of technology is significantly growing forcing chess lovers to adapt, some people just don’t feel comfortable with technology and are having a really hard time to adapt to this fast-changing technological environment. Spending their time on figuring out how to download specific needed program or application to make it possible just doesn’t work for them. So it is best to be honest to yourself and choose your way wisely. There is no wrong way while choosing and if there is enough passion, will and ambition both ways will get anybody to their goals in chess. It is always good idea to try all the options you can in order to decide what is best for you. Combining old school rules and new, modern possibilities was often shown as a really profitable way how in learning also in business. 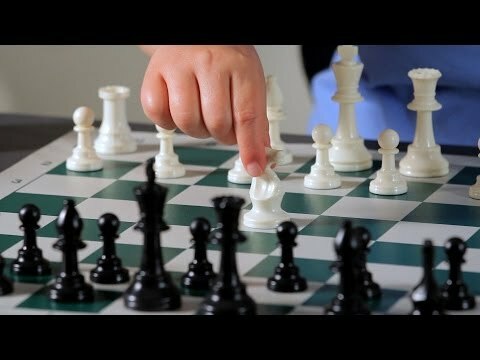 Why Should Kids Play Chess? Most of the people find the chess as a game that requires precise planning, patience, and intelligence so they keep their kids away of it. This is really wrong attitude because anybody that plays chess will only benefit from it no matter what age. Here are just some of benefits that will do a lot of good for your kid. It is proven by many studies that chess builds up the new dendrites in the brain. These dendrites present important neuro-connections in the brain and if their number increases it leads to great brain capacity and potential. Visual memory is significantly improved by the chess game and with this comes great concentration power and strong memory ability. Chess really teaches everybody to plan ahead. You really need to plan things out in order to win this game. This ability can’t come bad in real life too. This game teaches kids discipline in amazing way. As more you study and practice chess more you will win and this is a great strategy and skill that will help anybody achieve the goals in real life. All the cognitive processes like thinking, decoding, comprehension and analysis must be used while creating best chess strategy. It is often much easier for parents to do things for their kids instead of letting them do it on their own. This is what really kills skills like methodical or critical thinking. Chess does the opposite, it makes kids think ahead even for several steps before making the move. Let your kids find a solution for themselves. Allow them to learn on their own by introducing them with this great game. Original thinking is born from the giving your mind a chance to play with possibilities. This is exactly what chess does. It encourages everybody to conceptualize all possible moves. All these brain-inducing benefits come naturally while playing this game so don’t hesitate anymore. Not only you will spend some quality time with your kids but also have fun while your brain keeps exercising.